If you, like me, like to try out browser in the early stages, or if you’re just a fan of Opera – this might interest you. The alpha release of Opera 10 is available for download (and has been for some time). Head over and download it, and try it out. I’ve tried it briefly, and I like what I’ve seen so far. For only being alpha, it’s awesome. So yeah, no strip this Monday. 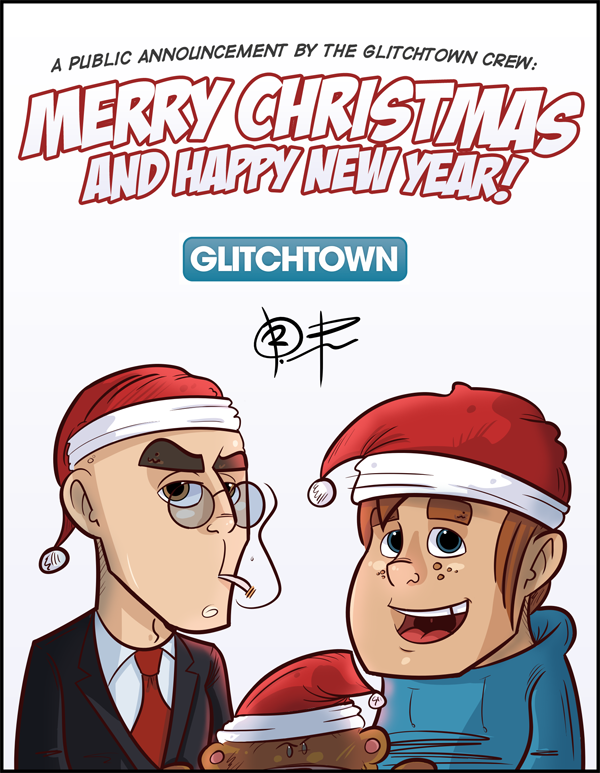 The xmas/new year card is the last thing you get this year (don’t worry, this coming Friday is “next year” – you’ll get a new fresh 09-strip then). It’s fitting to end the year with this, but I’m mostly doing it because I’ve entered a massive writer’s block AND artistically block today (yesterday). I do that quite often, but not both at the same time. I even tried to draw a strip about me TRYING to draw I strip. I couldn’t do it. I drew half a panel, before giving up. 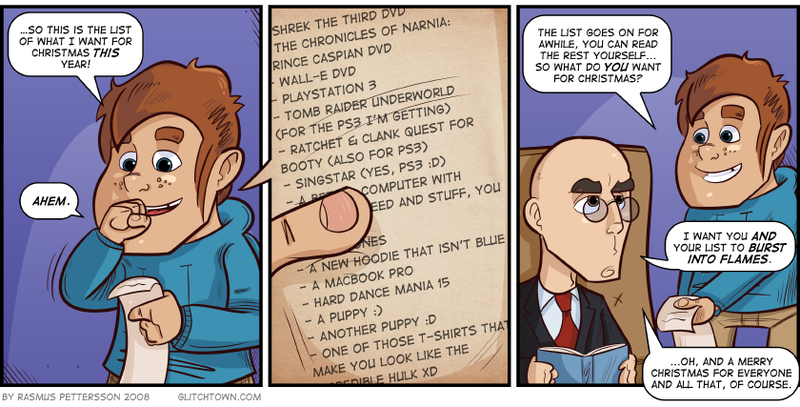 Then I read Penny Arcade instead. 1. Stare at the screen for half a minute. 2. 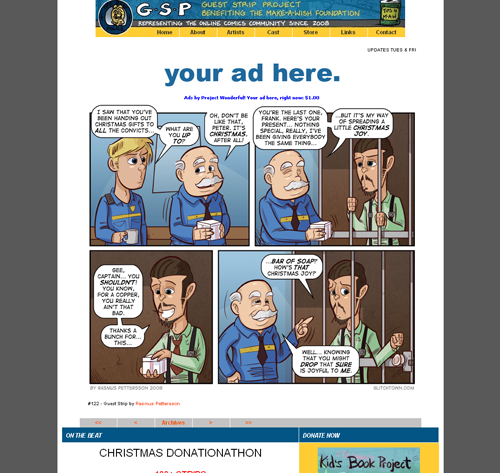 Pretend you’re reading a new strip. 3. Pretend it’s the funniest one yet. I’ll update the cast section with Houston’s picture today; I’ve changed Leslies and Isaacs already though. So, have a great new years eve, drink responsibly and above all – have fun. I’ll see you Friday. We celebrate Christmas on the 24th in Sweden. Christmas ewe’s what it’s all about, the Christmas day (today), is nothing special. Regardless, I hope you’re all enjoying yourselves, and are having a great time with friends and family and so forth and so forth. 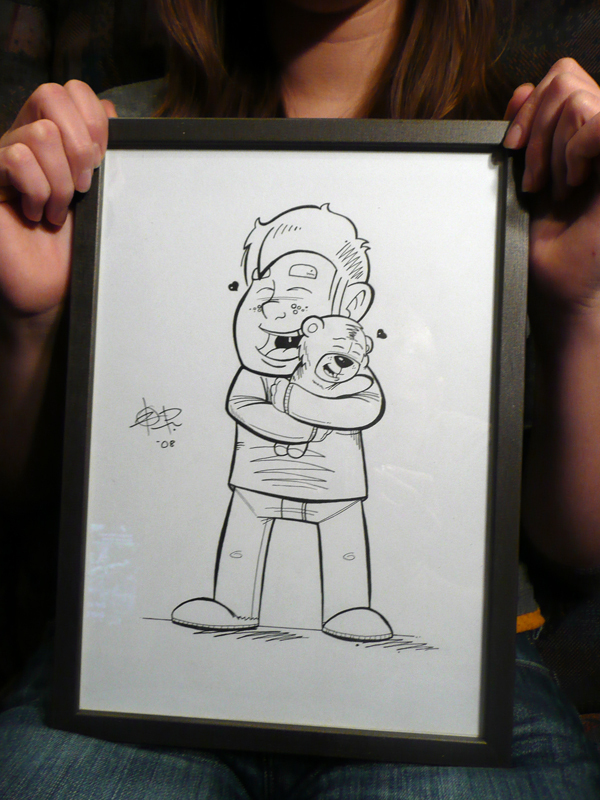 It’s an inked original of Houston hugging Leslie (and vice versa), took some time to make, and I was rather pleased with my line quality in this one. I’ve said it before, but: good line art means everything to me. I hope she likes it, and I hope you guys do to. So you probably know that I’ve been feeling sick awhile now, and as a result of that – I did not color the strip this Monday. However, I’m feeling much better now, so I went back and colored it. The way it should be. 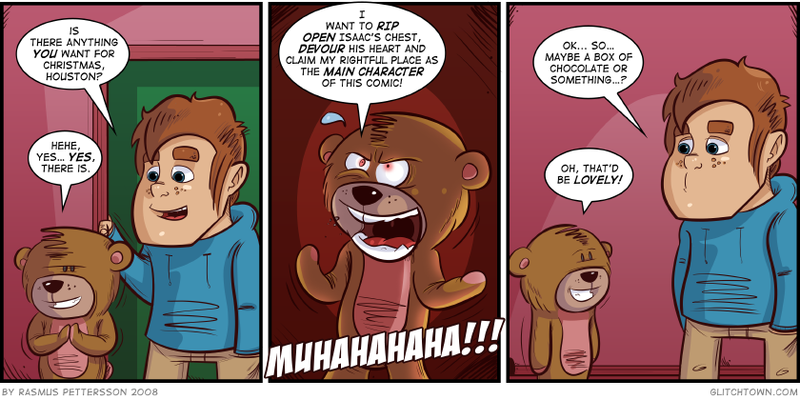 So go check out “That will suffice”, now in color. I know you’ve all ready read it, but wth. Look at the pretty color!